What Are the Crash Test Ratings of Your Car? The look of your car is important. So is the way that it drives and how comfortable you are in it. 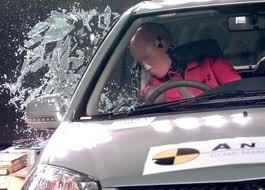 But one feature about your car that you probably pay little attention to is the crash safety ratings. Sure, the GPS system, power lift gate, and leather seats are all great features, but will they save your life in an accident? Nope. What exactly are crash test ratings? Your car’s crash test ratings determine how well your car will perform in the event of an accident. In other words, how much will your car indent, shatter, or crumple? How safe will you be after the dust settles? According to the Insurance Institute for Highway Safety (IIHS), there are five different tests performed on each vehicle. These tests measure the different kinds of impact you may face in an accident, such as in a head-on collision, a side-impact accident, a rollover, or if you get rear-ended. Each test ranks your car as either good, acceptable, marginal, or poor. How can I find out my car’s ratings? Luckily, it is very easy to find out the ratings of your car. You simply go to the IIHS website and enter the make and model of your car. You will then see the results in each of the five different categories tested. If different years received different ratings, these are broken down within each category. The ratings are very simple to read and are even color coordinated. The more green you see, the better. What if I am looking for a new car? If you are shopping for a new car, it can be a very fun process. But make sure you don’t get lured by a car’s good looks and charming personality before checking out its safety ratings. A good place to begin your search is actually with the IIHS’s top safety ratings. In order to receive this honor, a vehicle must be rated “Good” in each of the four main crash tests (moderate overlap front, side, rollover and rear). If you choose one of these vehicles, you can sleep a little better at night knowing that your car will keep you safe. While it is important to make sure your car has strong crash safety ratings, the best thing to do is to always drive defensively to avoid an accident in the first place. To find out more about this check out DefensiveDriving.com.